Sometimes a book comes along and fills a hole in your heart that you never knew existed. 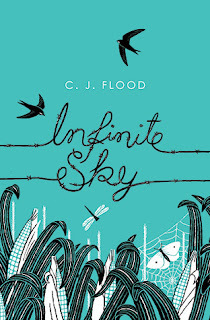 For me most recently, that book was Infinite Sky by CJ Flood, which I was lucky enough to read well in advance of its publication date. I was really attracted to the cover of the book and was expecting to read a cute story of a girl finding love over the course of a summer. Infinite Sky tells the story of one summer that changes everything for Iris, a 13 year old girl with quite a bit going on in her family life. Her mum's up and left to live in Tunisia. Her dad's a bit of an alcoholic and her brother is so angry all the time. When a group of travellers sets up camp behind their house, Iris finds herself curious about them, despite the things her dad and brother say about them, and makes friends with Trick. But it's only so long before tensions build-up between Iris's family and the travellers that kicks off into something far more serious. Right from the first page, I loved and was rooting for Iris. She hasn't got an easy time of it and she really struggles between listening to her father who forbids it or of forging her own path and befriending these travellers. And Iris and Trick are quite sweet together, finding a place where they can be apart from the problems between their two families and talk to each other about bugs and life and each other. Do you ever find yourself realising things about yourself or your relationships when reading a story that is completely separate to you or your life? The thing that got to me most about Infinite Sky is the relationships that Iris has formed, especially between Iris and her brother, Sam. I had a very similar and complicated relationship with my older brother who was very angry. Iris and Sam felt so real and believeable and it brought to mind so many things that I still feel and haven't dealt with about my brother and our childhood together. And I cried at how perfectly CJ Flood captured this on the page. I think the power of this book is in how the characters relate to each other and how wonderfully crafted this summer and this cornfield where two people get to know each other and fall in love is. It felt like I could close my eyes and be in this story alongside Iris and Trick and everyone. Everything felt very real to me and I reacted to things very personally. It's hard not to take to heart these fantastic characters and experience everything alongside them from love to heartbreak to loss! This is a beautiful book, one that I highly recommend!